An essential element of understanding weather is an understanding of atmospheric pressure and the changes that occur. Atmospheric pressure is the weight of the air pressing down on us. A column of air measuring one square meter (approximately 11 square feet) weighs 10 tons at sea level. However, that pressure can vary for any number of reasons. Atmospheric pressure is also known as barometric pressure and is measured by a barometer. A competent sailor keeps a weather eye on the barometer and is aware of changes in pressure. Changes in pressure are measure in either inches (Imperial measure used in the United States) or millibars (metric used in Canada). Air pressure is continually rising and falling as weather systems move through. We already know that when air is warmed, it rises. This creates a zone of low pressure. Cold air on the other hand is denser and sinks to the earth's surface, increasing the air pressure. These changes are measurable and have well-recognized qualities. Points of similar pressure are connected, creating isobars – those familiar lines we see on weather maps. Nature abhors a vacuum and any time there is an imbalance of forces, nature attempts to re-balance them With air pressure, this occurs by air moving from a High pressure zone to a Low pressure zone. Air would normally flow directly from a High to a Low. But ... remember the Coriolis Effect? It causes the direction of air flow (wind) to 'bend' – in the Northern Hemisphere, to the right – as it spirals out and away from the centre of the High. This gives rise to what is known as “Buys Ballot's Law”. Named after Christoph Buys Ballot, a Dutch meteorologist in the 19th century, Buys Ballot's Law says that if you stand with your back to a wind and extend your left arm directly out from your side, you will be pointing at the centre of the Low pressure zone. Knowing where the Low is centred and what your position is relative to its centre can be very useful in your planning. In the Northern Hemisphere, winds blow counter-clockwise around a Low. Winds will blow generally parallel to isobars, so seeing where you are located relative to the movement of the Low will give you some insight into how the winds are going to change as it passes. The closer the isobars, the stronger the wind. Here are some useful things, courtesy of NOAA, to keep in mind about barometric pressure. 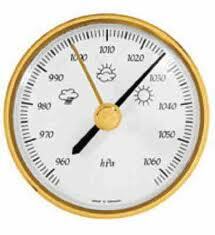 In very hot weather, the fall of the barometer denotes thunder. Otherwise, the sudden falling of the barometer denotes high wind. In frosty weather, the fall of the barometer denotes thaw. In wet weather if the barometer falls expect much wet. In fair weather, if the barometer falls much and remains low, expect much wet in a few days, and probably wind. The barometer sinks lowest of all for wind and rain together; next to that wind, (except it be an east or north-east wind). In winter, the rise of the barometer is a tell-tale sign of frost. In frosty weather, the rise of the barometer presages snow. If fair weather happens soon after the rise of the barometer, expect but little of it. In wet weather, if the mercury rises high and remains so, expect continued fine weather in a day or two. In wet weather, if the mercury rises suddenly very high, fine weather will not last long. The barometer rises highest of all for north and east winds; for all other winds it sinks. If the motion of the mercury be unsettled, expect unsettled weather. If it stands at "MUCH RAIN" and rises to "CHANGEABLE" expect fair weather of short continuance. If it stands at "FAIR" and falls to "CHANGEABLE", expect foul weather. Motion downwards, indicates the approach of foul weather.